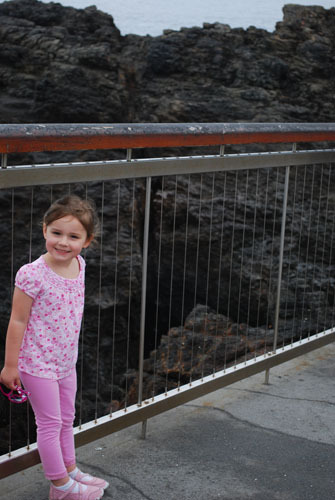 Day 2 of our holiday saw us take up trip up to Kiama to the blow hole. Unfortunately the waves weren't pounding enough for much excitement. 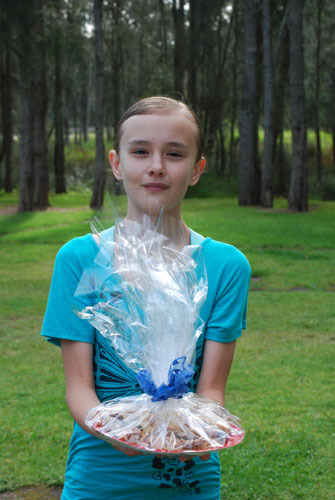 We went for a walk to the Information Centre and the kids bought some souvenirs. 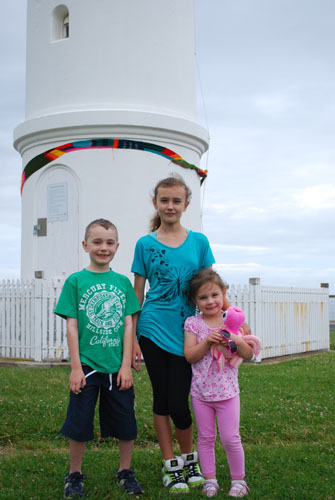 Then on the way back to the car, I made the kids stop for a photo with the lighthouse. You can see how enthused they are about this. The lighthouse was even sporting a pretty warm knitted scarf. After a lunch of fish, calamari and hot chips from one of the takeaway shops, we headed back to Gerroa. It was getting warmer despite the cloudy sky, so we lathered ourselves up with sunscreen and headed to the beach. The kids loved it! Steve taught Kate how to body board and she thought it was pretty awesome. Luke had a go too and even Amy had a go on some little waves. We walked down to the inlet to see if we could ride the flowing water from the river to the beach. It was flowing fast, but it was not deep enough. 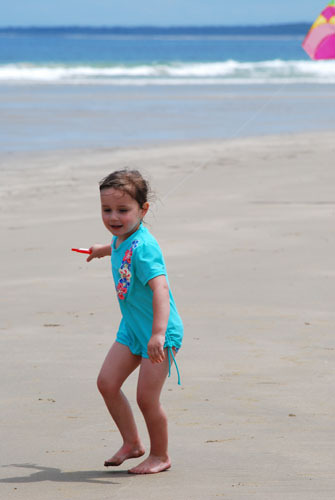 Then of course, we flew the kite. Lucky for me there are no people in the background of this photo to become Amy's 'other family'. One of my good friends gave us a plate of handmade biscuits for Christmas. The kids had been bugging me for a couple of days to open them, but I wanted a photo of them first. I made Kate be my model. This photo was taken outside the tent, the park surrounds were gorgeous. Back to the biscuits. They were amazing. Better than any cookie I have ever bought. Mmmm. The kids and I gorged ourselves on them. Gluttons, the lot of us! But they were just so good! And there concludes Day 2. I am surprised if you have made it this far. How nice that you have been away on a holiday and spent time enjoying other areas. These photos look great. I can't get over how tall Kate is these days and how much Luke and Amy have grown up. Wow time flies!